The holidays can be a magical time, but decorations and lights can create serious fire risks. 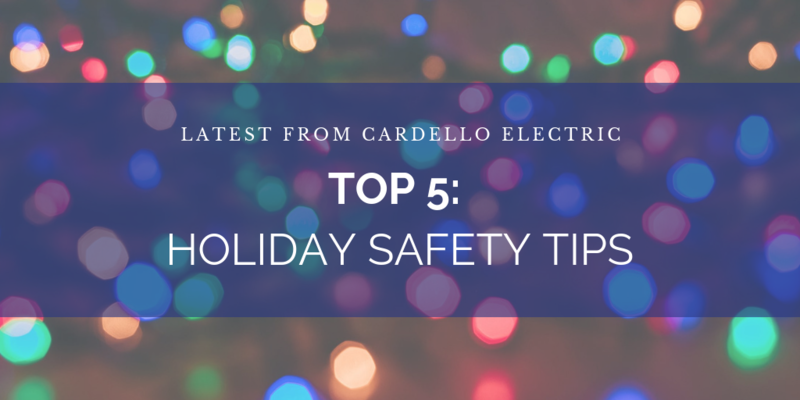 Keep the magic going this season by reading our top 5 tips for holiday safety! Christmas trees are an icon of the season, but did you know that each year they cause $13+ million dollars in property damage? When placing your Christmas tree, make sure not to block any exits and keep them at least 3′ away from heat sources like fireplaces, radiators and vents. If you are using a real tree, you’ll need to water it each day. And when you leave your home or go to bed, don’t forget to turn off your tree lights. Before starting to decorate with lights, it is important that each set be carefully inspected. Make sure there is a bulb in every socket and throw away any strands that have damaged or frayed wires. When decorating outside, check to see that lights and extension cords are labeled for outside use. When hanging lights, do not use tacks, nails or other methods that that will cause damage to the wires. Avoid overloading extension cords by using no more than three sets of standard lights per cord. Indoor lights should not come in contact with drapery, upholstery, or carpeting. Avoid placing cords in high-traffic areas that may cause tripping hazards. December is the peak time of year for home candle fires. Never use lit candles on a tree or within 12 inches of anything that may burn. Make sure candles are on a stable base and are not located in an area where they could be knocked over. If someone in your home is using oxygen, do not use candles. Never leave a candle unattended especially if there are children around. If you do have children in the house, consider using battery operated flameless candles instead. We get it. There can be a LOT of wrapping paper left laying around after Christmas morning and it can be so tempting to just throw it in the fireplace. DO NOT DO THIS! Paper burns very quickly and intensely, igniting flash fires, unruly flame heights and traveling embers. If that’s not enough, the ink and glitter used in wrapping paper may contain metal that will give off toxic fumes and release dangerous particles into the air you and your family are breathing. 5. Prevention, the Gift that Keeps on Giving! Unfortunately, fires do happen. Whether its due to Christmas decorations or not, the last line of defense you have is your smoke alarms. Be sure to have them installed on every level of your home, outside sleeping areas & inside each bedroom. Test them every month, install fresh batteries annually and replace alarms that are older than 10 years. Plus, if you’re looking for a gift for someone whose just recently moved, they can make a thoughtful holiday gift! From all of us at Cardello, we wish you and your family a safe & happy holiday season! For more on holiday safety, view the resources below.